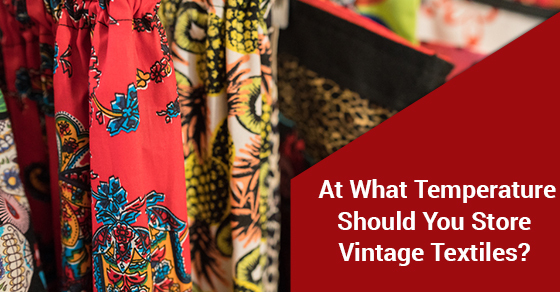 What Is The Optimum Temperature For Storing Vintage Textiles? Self storage units are used to store all manner of items, even vintage textiles. For older, more delicate items, people often opt for a storage facility that offers climate controlled storage. Certain items require a constant climate in order to maintain their look, feel, shape, colour and structural integrity. Below are some tips for keeping your climate controlled storage unit suitable for vintage textiles. The Smithsonian Institute, one of the world’s foremost collectors of valuable, historical items, strives to store their textiles at 45 percent relative humidity and 70 degrees Fahrenheit. This is not always possible to achieve, but staying near these targets, in addition to separating individual textiles with acid free tissue, rolling in acid free tubes, and storing in acid free boxes will go a long way towards protecting your vintage textiles. Fabrics on antique furniture need to be protected just like other vintage textiles. Climate controlled storage units should be kept within a temperature range of 50 to 80 degrees Fahrenheit in order to eliminate humidity, and stop mould and mildew from forming. Many facilities also come with dehumidifiers in their units, especially for units on the first floor, or below ground. In addition to the above recommendations for storing vintage textiles generally, certain types of textiles have specific storage requirements that should be observed. Leather and suede should always be stored in a cool, dark, well-ventilated space. Rayon should be stored flat. Linen garments and textiles should be rolled up and covered with white muslin that has been properly washed beforehand. Knitted and silk fabrics should always be stored flat. Fur should also be stored in a cool, dark place, just like leather. Cold storage is always the best for fur. Wool should always be thoroughly cleaned, padded and wrapped in white tissue. You should also include mothballs as wool is one of the first textile materials that moths are going to attack should you experience an infestation. To get the most out of your climate controlled storage, your textiles should always be stored loosely so that they can breathe, especially if they are going to be stored for long periods of time. Cool and dry climates require well-ventilated storage units. You can also, in addition to a dehumidifier, use slabs of chalk to help soak up and absorb moisture in the atmosphere. Keep the above information regarding climate controlled storage and antique textiles in mind and make sure that your textiles last for years to come.